Wheatgrass is packed with nutrients that support and maintain health and wellbeing. Health Elements Wheatgrass is one of the most beneficial supplements available, working to sustain your natural balance. Our freeze-dried Wheatgrass is 100% certified organic. We do the hard work of carefully preserving and packaging our Wheatgrass to ensure you receive all the powerful benefits its juice contains. Maintaining healthy blood and circulation. May support healthy blood levels. 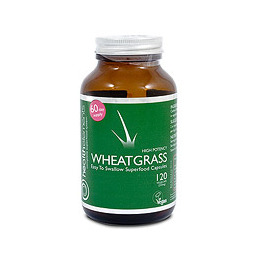 All Health Elements Wheatgrass products come in nitrogen flushed dark amber glass bottles. Health Elements Wheatgrass is field grown and sown in late autumn. This means our plants develop a substantial root system, crucial for rich nutrient density. We understand the importance of treating our Wheatgrass with the care that nature intended. We allow the Wheatgrass its full natural time to develop a full complement of green food enzymes. This makes Health Elements Wheatgrass juice as nutritious as possible. Health Elements Wheatgrass juice is made with organic Wheatgrass harvested from outdoor field grown plants. We grow our plants for up to 45 days, that`s almost four times longer than the average greenhouse and tray-grown Wheatgrasses. This extra growth period allows the natural sugars in our grasses to be utilised in a slow, natural cellular transformation, helping to produce enzymes and other valuable proteins. Health Elements Wheatgrass juice is not as sweet as less naturally produced Wheatgrasses. This means our juice has a high quality amino acid profile - just as nature intended. 100% carbon dioxide dried Wheatgrass juice powder (333mg per capsule) in vegetable cellulose capsules. Below are reviews of Health Elements Wheatgrass - 120 x 333mg Vegicaps by bodykind customers. If you have tried this product we'd love to hear what you think so please leave a review. Wheatgrass is packed with nutrients that support and maintain health and wellbeing. Health Elements Wheatgrass is one of the most beneficial supplements available, working to sustain your natural balance.